I love eggs and I am always looking for new ways to include them in my diet. In my early clean eating days, eggs were a massive part of most of the meals I ate. Our neighbours at the time had chickens on their land and they would deliver fresh eggs to us every week. Oh how I miss those day! They were the best happy eggs I have ever eaten. Eggs make a pretty inexpensive meal, snack or side dish. 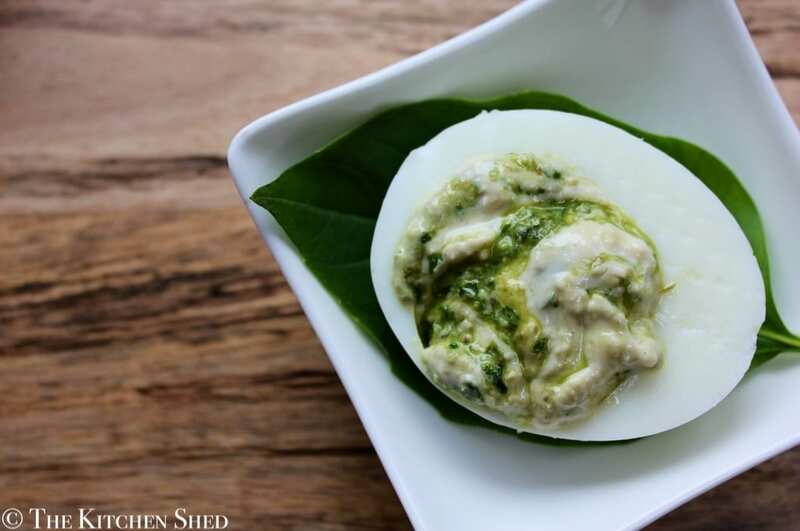 I always take boiled eggs along to pot lucks, since I know they are clean and everyone loves them. Now I can take along these fancy little things, although I would probably assemble them just before serving – otherwise they could get a little messy! 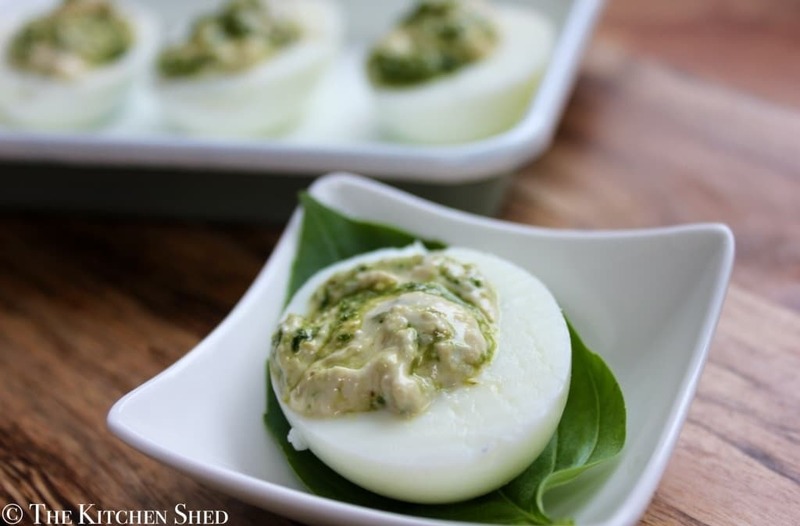 Clean Eating Pesto Deviled Eggs are nutritious and very delicious! They are great as a snack or as a side dish at a family buffet. You could enjoy them in a wholemeal sandwich or wrap for a complete clean eating meal. Remove the shell from the hard boiled eggs and cut in half length ways. Remove the yolks and give the eggs a little wipe to clean them. Place the houmous into a bowl and top with the pesto. Using an ordinary table knife, gently swirl the pesto through the houmous until is looks marbled. 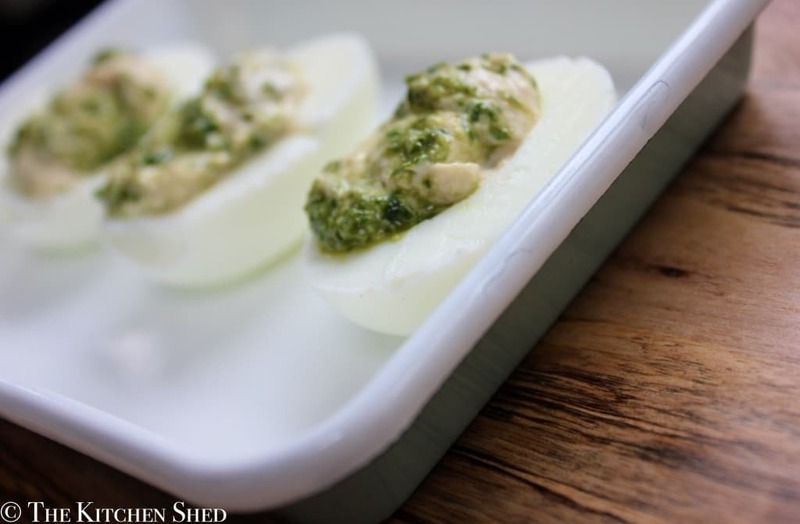 Spoon the houmous and pesto mixture into the egg whites and serve.